Jane: For the past two years, our foster care staff have participated in writing groups led by Rise’s Editorial Director, Rachel Blustain. The group allowed the caseworkers to talk about what it’s like to do their job and to write stories about their experiences working with parents with children in foster care. Elizabeth: We wanted to give staff an outlet to express themselves. It can be such an emotional experience working with parents. This was a way for them to reflect on their own biases and what they’re realized about themselves and learned along the way. Jane: At the group’s graduation, many of the participants read their stories. I was struck by how intimate the stories were. Rise has the ability to really create a feeling of safety when they do these groups so that writers can take chances in exposing their feelings. The stories show how the caseworkers’ personal experiences have informed their work with parents. Universally, they focused on a very specific turning point that changed them, not only in how they worked with that family, but with all the families they work with. They chose cases that made them more empathetic, and a better caseworker. One caseworker described working with a very angry father. When he started, everybody had warned him that this father was very difficult. This young man shared in his story how he first saw this father the way he saw his stepfather, but over time found he had a lot in common. You rarely see that kind of reflection in trainings or even in the peer support that we try to offer to staff. Elizabeth: One story that resonated for me was about the power dynamics between parents and caseworkers. The writer realized how much power she had over these parents, and how much she didn’t want to abuse that power, even unintentionally. Senior staff might not understand or think about that. If anything, we think of the lack of power our frontline staff have in the bureaucracy of this system. But this very young woman had a power over people that she wasn’t comfortable with. I already have a lot of respect for our staff, but hearing their stories, I had an added appreciation. They were so compelling, vulnerable, even raw in some cases. I was impressed with how honest they were and strong in being able to express their experiences. I know the job is very hard. These are very heavy issues to confront at a very young age. Jane: The staff were overwhelmingly positive about the experience. They were surprised at how useful it was. They didn’t go into this thinking that writing would be helpful, but they found that focusing in on the personal really informed and improved their practice. I was also so struck by the professionalism of the group leader, Rachel, because she stayed in the background and really encouraged our staff to take the lead. She was the perfect person to lead our staff in looking internally, which is not easy. Elizabeth: For the staff, the writing was therapeutic. The stories also informed us—upper management and the board. We asked two of our staff to share their stories at a board meeting, and one of them shared her story at a managers’ meeting. Their stories gave people outside the work a look at the reality of it. People may have a good sense of the requirements and job description but not the human part of being a caseworker. Jane: Our board found the stories interesting and moving. Several trustees spoke to me about them afterward. The stories gave them more of an understanding of our work at Sheltering Arms and the families we’re helping. Elizabeth: Our next project with Rise is to use Rise’s new visiting TIPS to help parents and staff with visits. The TIPS are handouts that offer parents guidance about how to handle visits. We hear from staff how hard supervising visits can be. They’re often at the end of the day when staff are exhausted and have other work they want to finish, and they’re emotional. Frustration comes up in the visits out of expectations that aren’t met. You might think that parents and children would come in and just be so happy to see each other, but sometimes they’re not. The reality is that there’s anger and sadness. We don’t always prepare staff or parents for the realities. The TIPS are a practical way to prepare them. Jane: We are always looking for new ideas and opportunities to do more than just traditional training. 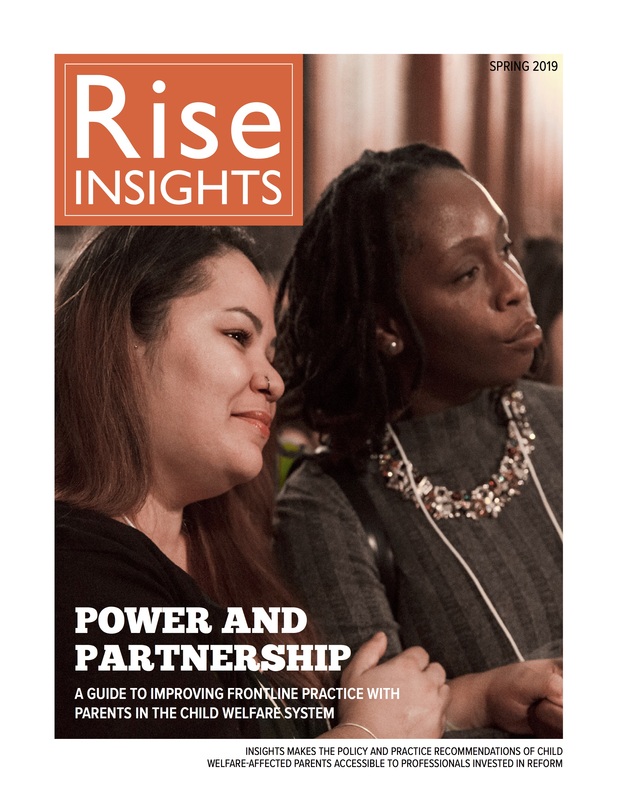 We’ve come to see Rise as an organization that’s very thoughtful about how to do sophisticated training with caseworkers that we’ve seen have a real impact.